My family along with some friends always visit Terra Nova National Park during our summer vacation. One of the main events of this annual visit is to hop in our vehicle and explore the region. The Eastport Peninsula did not disappoint as these is always something to see and do, even during unseasonal temperatures that we experienced this year. On our journey we decided to visit Happy Adventure, a quaint little community with breath taking views. During this time my wife and I decided to visit a surprising find that we discovered last year. 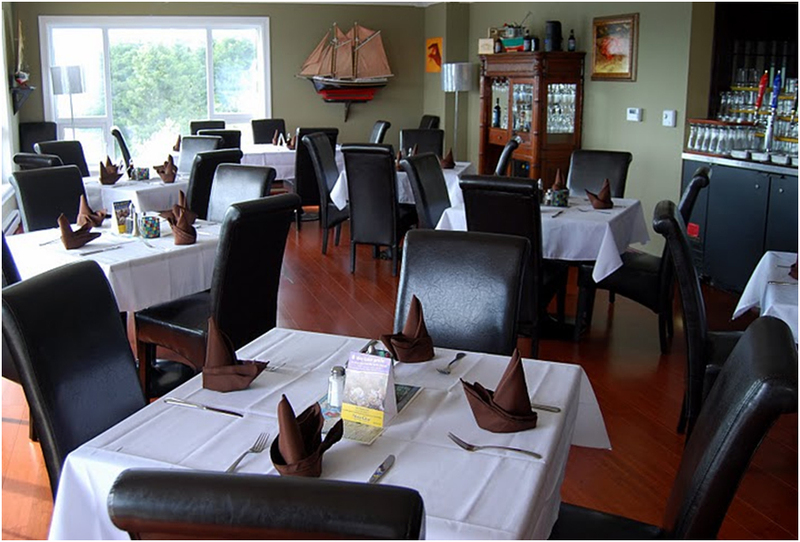 We stumbled upon Inn at Happy Adventure, a beautiful building overlooking the Harbour, we surveyed the facility and at that time opted out of entering as there were specific hours they were open and it looked too fancy for us adventurers. When visiting this year we discovered the restaurant was open so together with our friend’s and children we entered. My initial reaction was wow, what a beautiful room with an amazing view. The owner could not have picked out a better location for such a facility. While waiting to be seated I had the opportunity to check out some of the art work with was displayed throughout the room, very impressive. Once seated, we were greeted by a polite server who seemed both enthusiastic and knowledgeable, these are two things I look for when visiting eating establishment; it sets the mood for the entire event in my opinion. The table had a lunch time table setting complete with a paper place mat of Quidi Vidi Brewing Company. It toned down the restaurant and made us feel we were welcomed. 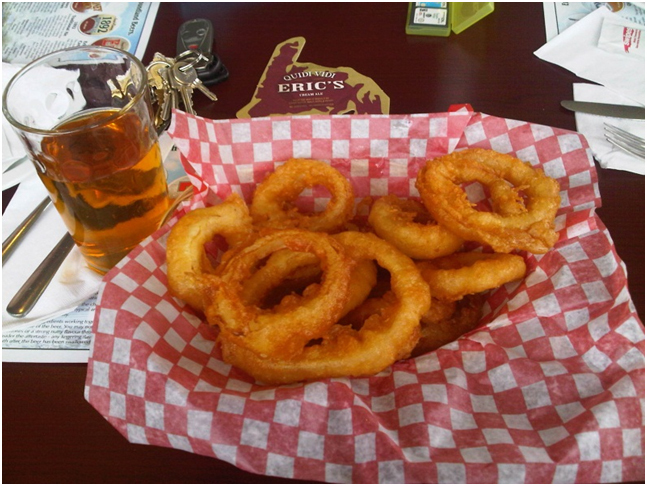 I started the meal with homemade onion rings, it was a large order for a appetizer but none were left behind as they were golden brown, crispy and flavorful. After a brief discussion with our server he was quick to point out that their fish was caught the day before so we were in for a treat if we ordered it. 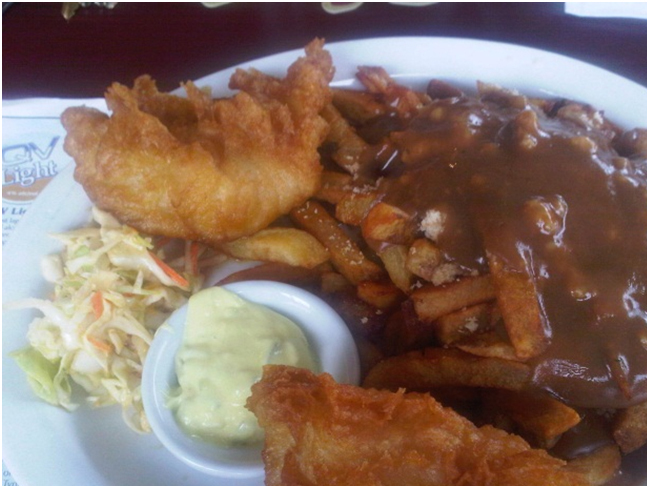 I made the quick decision had the cod with home fries, dressing and gravy. The cod turned out to be the freshest I have ever tasted, my wife was also happy with her order minus the gravy. It was moist and juicy and paired well with my Eric’s Red brew that was on tap. 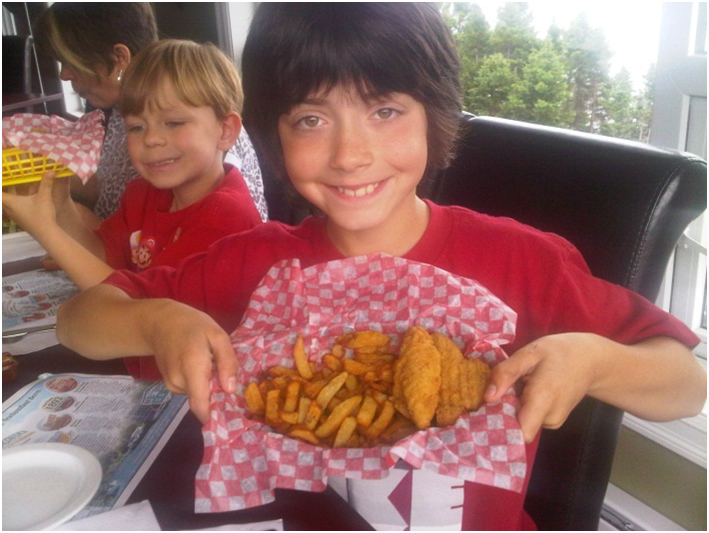 I usually do not wave the banner on too much deep fried food but when it is good, then I have to write about it. 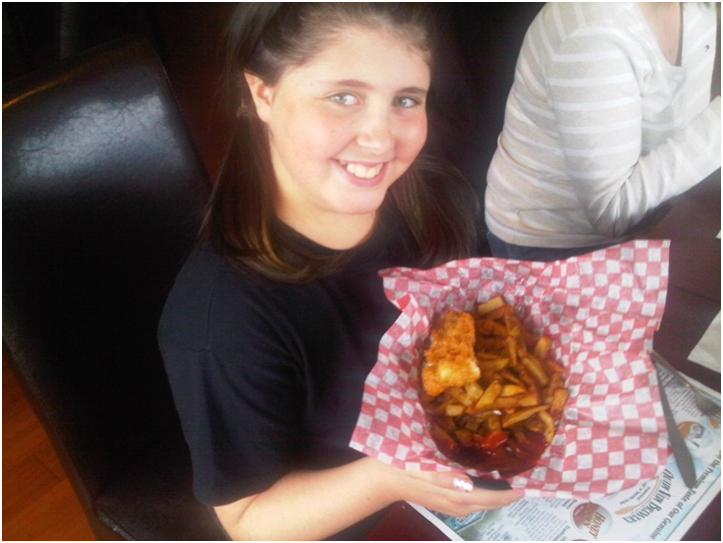 High Points – fresh Cod prepared to perfection, our friends the Tobins loved the chowder. A pleasant, surprising experience was had by all including our children. We are all looking forward to going back next year.